According to blogger, Zionist True Believer, 'onetruth', all versions of these photos, except two, are forgeries as mentioned in the 'holocaustcontroversies' / HC post below. I wanted a specific thread for these 'photos' so they don't get buried. Upfront I will state that I believe they are ALL clumsy forgeries which have blown up in 'The 'holocaust Industry's face, therefore their need to come up with an excuse, any excuse in attempting to distract from the fakery involved. Note the different numbers of 'corpses', the laughable rubber armed men, the spaghetti women, the staged 'window frame', etc. I hope that's all of them, if not please post the others. Read on and see the rationalization that is used below. According to this 'holocautcontroversies', any other versions except two are forged. And note the reference to some TV show which I have never seen and the allegations made about it. If you start with false premises, everything you subsequently extrapolate from those premises will likewise carry along the original error and thus exhibit error within themselves. 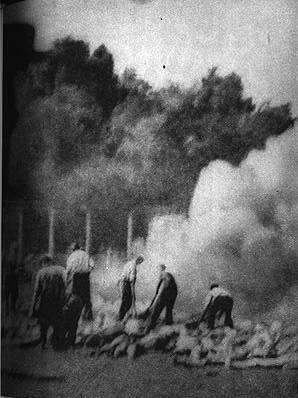 The photo shows the members of the Sonderkommando doing their job around the cremation pit. Smoke rises from the pit, and plenty of corpses to be cremated lie all around. The photo has been known since 1945. Although its original negative is lost, a number of contact prints can be found in the Auschwitz Museum, along with a large print over 18 inches wide. There is also a version with lower contrast, where more details can be discerned. However, the photo presented in the programme shows much fewer corpses than the Auschwitz photo; or maybe they are not even corpses but some debris or train wreckage. Immediately, the charge was raised that the Auschwitz photo is in fact fake; it is a modified version of what is actually a photo of an 1912 Ohio train accident. We can use Google's image search which has the nice feature that we can upload an image and search by it. Thus, we can upload screenshots from the episode and find corresponding images on the net. In a few seconds, it turns out that the first image is actually a photo of a Texas train accident (Bowie, TX) while the second one is that of a California train accident. Besides, others have already noticed that the photos of burn victims shown in the episode are actually modified versions of photos of Hiroshima bomb victims. It is obvious, then, that Ghost Adventures didn't present photos of the actual 1912 Ohio train accident. The crew probably used Google's image search to find old photos to illustrate the topic, and they modified them to fit their needs. We cannot really blame them for this; after all, this is not a historical documentary. It is a paranormal show for entertainment purposes. The train accident is not the main topic of the episode, and these photos are only shown for a few seconds. However, it is still possible that the photo shown in Ghost Adventures is the original one (possibly indeed showing a train accident), and the Auschwitz photo was created by modifying it. This is somewhat doubtful, though, as there seems to be no reason why an inward-curving barbed-wire fence would be set up along railroad tracks. Besides, we haven't been able to find on the net a copy of the photo shown in Ghost Adventures with a date earlier than 2010 (this particular episode was first aired in January 2010). But let's examine the two photos more closely! There are a lot more corpses in the Auschwitz photo. Was the original photo the one shown in Ghost Adventures, and more corpses were added later to obtain the Auschwitz photo? 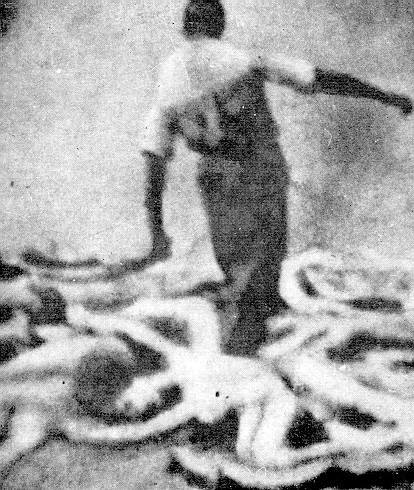 Or the Auschwitz photo is the original, and most of the corpses were removed to create the version seen in Ghost Adventures? The upper image is the one shown in Ghost Adventures, and the lower one is the Auschwitz photo. Rectangles with the same color enclose identical portions of the images. There is thus no doubt that the Auschwitz photo is the original one. The other photo was created by digitally removing most of the corpses by copying and repeating portions of the ground. Most likely, this editing job was done by the Ghost Adventures crew. They probably didn't do it for fraud. It was very unfortunate, however, that they couldn't find anything else but an iconic Auschwitz photo to illustrate a train accident, and they even adjusted it to fit their needs. And of course, it is no surprise that the extreme confirmation bias of holocaust deniers led them to jump to conclusions, immediately proclaiming that it must be the Auschwitz photo that is fake. The location where the photo was taken can be easily identified, and its genuinity is supported by its match to the present view of the place. What's more, a British aerial photograph taken in August 1944 shows dense smoke rising from exactly the place where the photo was taken. March 2017? New wild denier theory? Are there still "deniers" claiming that the pic in Ghost Adventures is a photo of the 1912 train accident in Dresden, Ohio? What's next? Young researcher Jean-Claude Pressac defeats deniers with brand new discoveries??? That a TV show used a fake 'holocaust' photo, and there are tons of fakes, is irrelevant to the fact that the photo / photos are phony as a three dollar bill. 'Ghost Adventures' had nothing to do with it. "The Holocau$t Industry", nailed again. 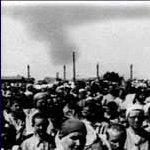 I still think this photo, if taken at all at Auschwitz, was taken later in 1945 after liberation. Furthermore there is no proof these bodies were murdered and were jews. All in all a mess or mutton dressed as lamb. What's the source of the giveaway (2nd pic)? Gross forgery. Quite appalling. 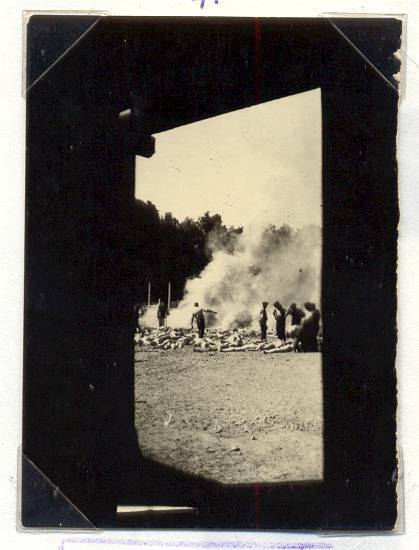 Arthur Butz used a photo of open burning pits alleged to be north of Krema V. If I remember correctly he was talking about the typhus epidemic in 1942 and because the camp lacked enough cremation capacity, the dead were burned in open pits. I believe there were aerial photos of it because the US was interested in the Buna rubber plant and trying to get the technology. See "Hoax", Fig. 7. From what I have read about burning bodies in the open, it would not go far to dispose of the alleged 5000 corpses a day. It requires lots of wood and takes around 6 hours; bodies are 70% water. If there was heavy reliance on burning in open pits, the area would be devoid of trees. .... after the alleged gassing are said to have stopped. So why was it not made available to the public earlier, when the impossible gassings are said to have been occurring? its original negative is lost". If anything, doesn't this photo, if indeed genuine, exonerate the Germans of having used cyanide poisoning to execute these alleged inmates? As far as I understand it, cyanide poisoning typically causes the flesh of the corpse to appear pink or bright red. It is not only obvious that, even though a black and white photo, the corpses do not appear to have shown this pigment, but also, the living humans surrounding and amidst the piles of bodies clearly have skin that appears to be much darker than that of the corpses. Assuming the standing persons are not of African descent, which seems unlikely, wouldn't the shade of the light reflecting from the corpses have been much darker than that of the standing persons, had they indeed have been executed by introduction of cyanide into their respiratory system?